Jenny Zarate is an esthetician with great devotion for skin care. Wanting to pursue her passion, she enrolled at the highly regarded San Francisco Institute of Esthetics and Cosmetology, where she graduated with high honors. With what she learned, she was able to subdue her own skin care challenges - acne, hyperpigmentation and aging -- and she would like to share her knowledge with you. Jenny is very results-oriented and takes pleasure in helping guests with their skin care needs and achieving their desired outcomes. Continuing her education in skin care, Jenny attends post-graduate classes at the International Dermal Institute and beauty trade shows and conferences to enhance her skills in facials, body services and waxing. She is devoted to continually learning about the latest findings and technology of the industry so she can share her findings with her clients. The foundation of any brand identity, Jenny's logo communicates her devotion to research and scientific development of new skincare regimens and techniques while also conveying the aesthetic and values of her skincare studio. 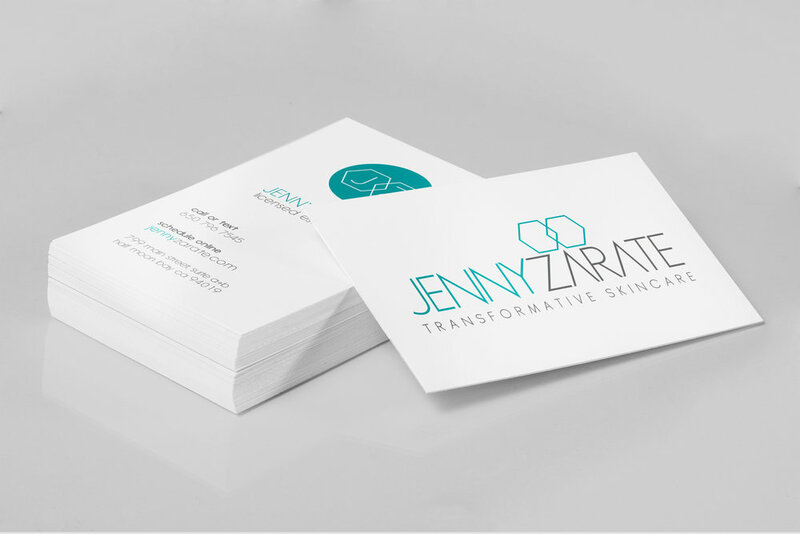 A printed handshake and lasting first impression, Jenny's business cards are in keeping with her branding through use of a sueded paper stock and spot UV to highlight logo and icons. Jenny wants her clients to feel refreshed during, as well as after each treatment administered. Choosing imagery that communicates a fresh, natural and cleansed feel is integral to both print and online applications.